Now that we're in November, preparing for the holiday season is critical. Your competition is potentially world-wide thanks to today's technology. Although, just as technology has increased competition amongst organizations to attract and retain new customers. Technology, like complete CRM, helps you connect and interact with customers in a lot of different ways. This time of year is celebrated by most as a time to reconnect and strengthen relationships, why would your business strategies be any different? By using CRM and marketing automation, you can effectively and target and nurture your leads and clients. By combining sales, marketing and customer service data, you gain valuable insights into who your customers are, their preferences, and what makes them tick. This information lets you build better strategies to help you generate and convert every lead into a long standing customer. Just like the strands of a rope, your systems and strategies are better (and stronger) when tied together. A quick review of CRM and Marketing Automation software tools is found on Capterra. "What's the Difference Between CRM and Marketing Automation Software?" by Dingeldein, T. (2018, June 21) simply explains these two vital tools that can be integrated to boost sales. Customer Relationship Management technology allows you to collect customers' data and use it to analyze your customers' shopping history, build relationships with your customers, and increase sales. Marketing Automation gives you the means to build, schedule and track a marketing campaign with data analytics to measure its success. These two strategies should always be integrated. CRM is focused on your customers, sales, and data management, while marketing automation focuses on email marketing, leads, behavior tracking and more. Both tools are necessary to gain a complete 360-degree view of your customer and deliver optimized and successfully converting sales and marketing campaigns. Both your CRM and Marketing Automation tools are important in creating a strong customer experience, and even more powerful when used together. The CRM helps track and manage the engagement and the unique relationship you’re building with your customer whereas the Marketing Automation allows you to set up the custom touch points to continue to nurture that relationship. Found on B2C, "5 Ways Integrating CRM with Marketing Automation Will Help You Boost Sales and Grow Your Business" by Hamm, S. (2018, January 4), explains how integrating these two applications can give you a powerful combination or as he says it, "game changers for small, medium-sized, and large businesses." What stands out about marketing automation are the statistics Hamm reports for those companies that have instituted this software with reportedly "77%" of marketers now utilizing this tool. "Qualified leads have increased by 450%." Sales productivity is reportedly up on average of "14.5%." Customers are projected to handle "85%" of their business transactions electronically without human intervention. 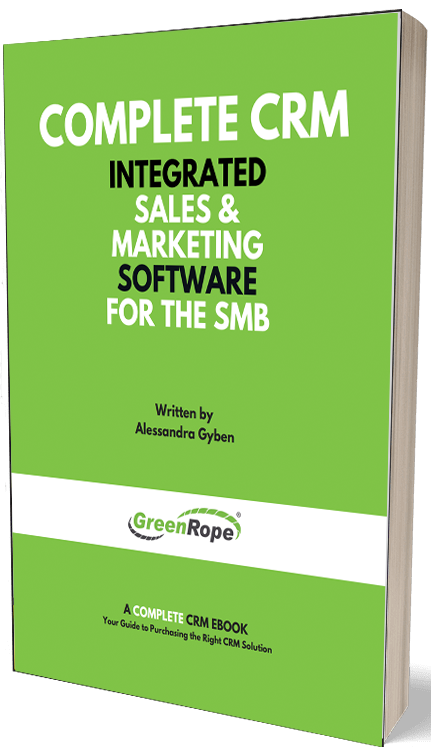 The author further points out that "3 of 4 businesses" are seeing favorable results after having integrated CRM and marketing automation. Lead nurturing is enhanced with a more efficient means of collecting data and sending it out. Business intelligence is increased that will give you more information regarding your customers visiting and purchasing habits. Prioritization of your leads to see what customers are more likely to purchase merchandise. Your sales cycle is shortened through scheduled marketing efforts and faster evaluation of what is working and what is not. Marketing campaigns results are quickly captured for continuous changes and improvements. Complete CRM is a new kind of software that focuses on making your business processes connect and bring everything together, in one comprehensive platform. Put your sales and marketing under one roof. Statistics prove that integrating these two platforms together will help to scale your organization. Fragmented, unorganized data damages your business through inaccurate tracking, not following through, and ultimately leading to lost revenue. Investing in a complete CRM allows you to consolidate your data, team, and clients into a single platform to regain control over your company’s operations. No more flawed, out-of-date or skewed data. Instead, you get a complete view of your business, keeping your team accountable and all of your results transparent. Interested in learning more. Download this guide to Complete CRM today. If you aren’t already a user, let GreenRope show you how we can improve your bottom line with our innovative products. We will help you make your 2018 Holiday Season and set your organization up for future growth.